Wonder Woman is out with Steve Trevor in her civilian guise of Diana Prince. They come across a “weight-and-fate” machine that will tell you your weight and provide a printed card with your fortune. Steve goes onto it and his card reads “The biggest surprise of your life is right beside you!”, which Diana tries to write off as bunk but is secretly concerned that by sheer coincidence the card may compromise her double identity. Steve convinces Diana to go onto the machine herself and her fortune reads “today will be your trial by fire”. As Steve begins to speculate what her fortune may mean, Diana dismisses it as simple superstition and refuses to entertain what her future has in store for her. When a store having a fire sale is being robbed, Steve tells Diana to get out of his jeep while he goes to tackle the crooks. This allows Diana to change into Wonder Woman, unnoticed to tackle the crooks. Which she manages to accomplish and quickly changes back into her Diana Prince identity without anyone, let alone Steve, being any wiser. While driving on, the two happen past a explosives works factory where a giant experimental firework is being worked on. They notice the workers fleeing when the fuse is accidentally lit. Steve goes in to see if he can use his anti-demolition expertise can help put out the fuse. 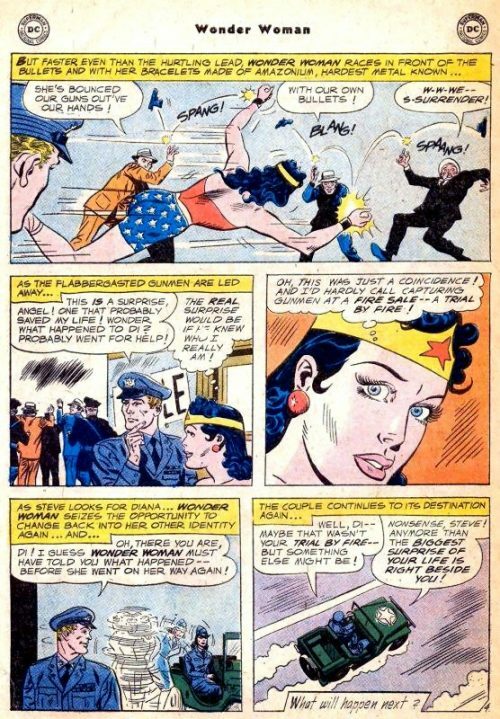 Left alone, Diana changes back into her Wonder Woman identity and takes the giant firework off into the air by using her lasso as a propeller. With too much sky traffic to allow for safe detonation in the air, Wonder Woman leads it down into the ocean below where she spots an enemy sub. The sub fires a nuclear missile at the giant fire work and Wonder Woman manages to get away just as the two impact and explode. When she surfaces she spots two fire boats trying to put out a blazing ship fire and helps out by creating a massive water spout that douses the flames. 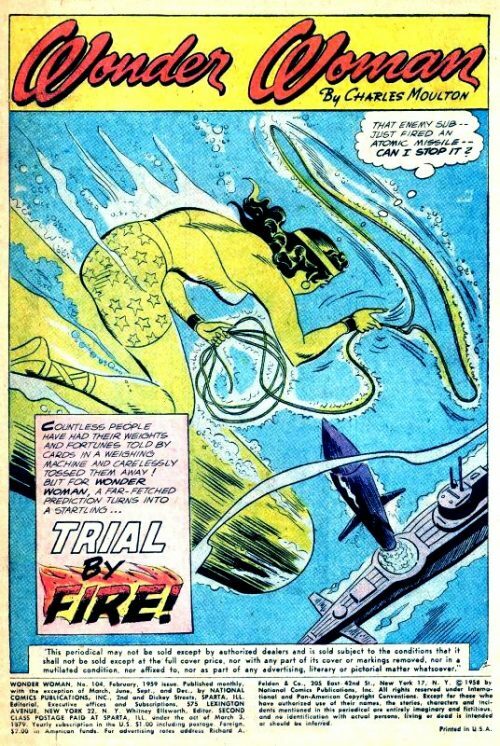 Returning to shore she changes back into her civilian guise and returns to Steve who is still oblivious to the fact that Diana is Wonder Woman. Trying to deflect questions about her fortune, Diana and Steve go to check out a flea circus and stumble into the insane owners plot to have a great new attraction: using a shrinking ray he shrinks Steve and Diana down to size and places them in his flea circus where he forces them to fight a firefly. 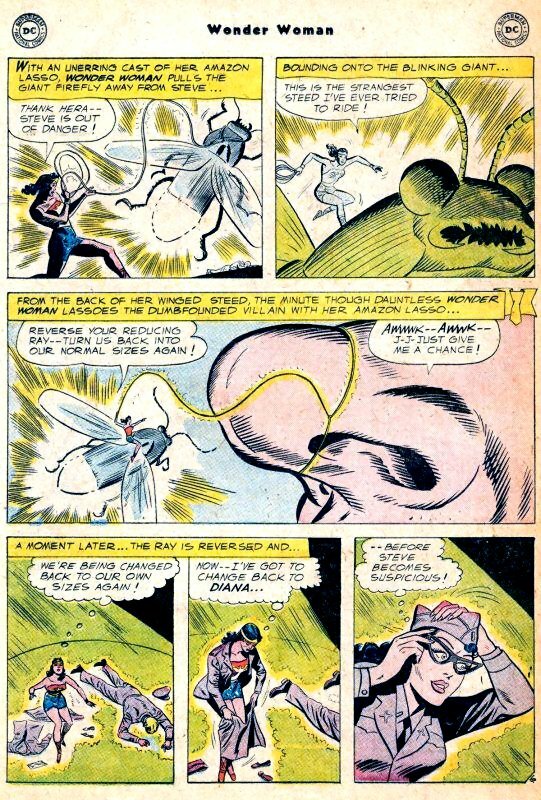 Steve is knocked out early on giving Diana an opener to change into Wonder Woman, corral the firefly and force the owner to return them to their original size. 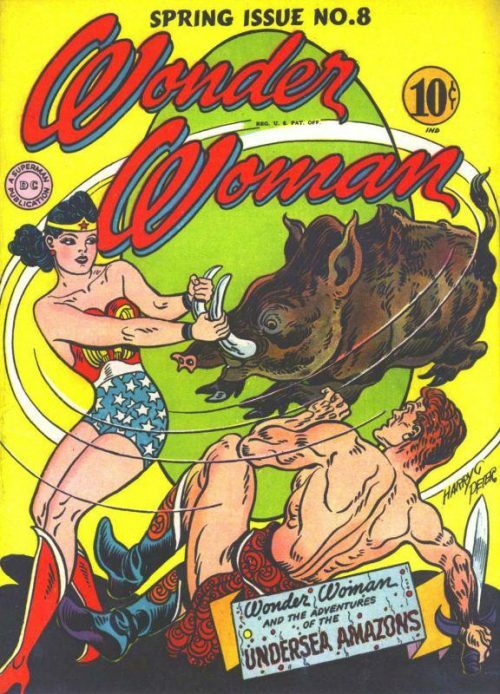 Wonder Woman changes back into her civilian guise before Steve can revive and discover her double identity. Next as they drive on, they spot an apartment fire, prompting Steve to stop and see if there is anything he can do to help. 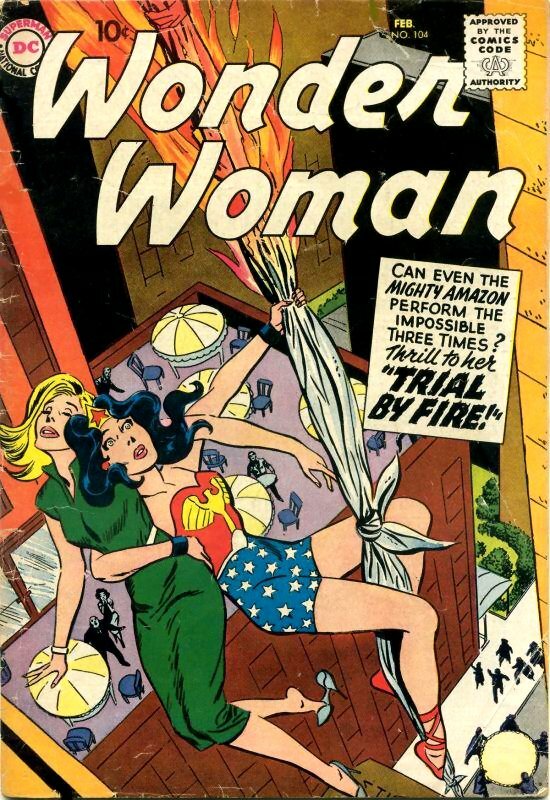 Once more allowed to change into Wonder Woman, Diana saves a woman trapped in the building. Later, Steve begins to realise that every time Diana is supposed to have a “trail by fire” Wonder Woman shows up to save the day. Wonder Woman, quickly convinces Steve maybe this is what his fortune had meant that his big surprise would be that Wonder Woman would come to the rescue each time. Steve is satisfied with this, thus preserving Diana’s double identity. One the planet Mars, preparations are under way however the Martians here cannot agree who will lead the invasion. When the Duke of Deception arrives, he explains that the person who should lead the invasion should be the person who succeeds in defeating Wonder Woman, a task that the Duke intends to succeed at, and already has a plan underway. 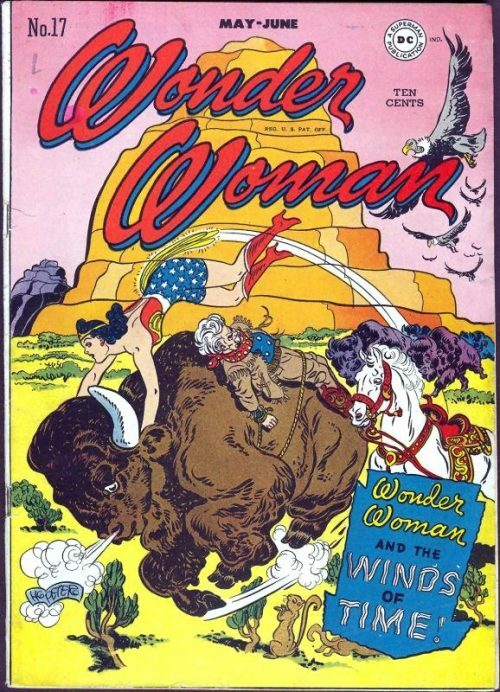 On Earth, Wonder Woman and Steve Trevor witness the launch of a newly constructed satellite. They both marvel over how it can travel over 18000 miles per hour and has been constructed to ram through anything in it’s path. Later they participate in a charity wherein everyone pays to get a key and whoever’s key opens a treasure box will win a valuable prize. Wonder Woman hopes to win the prize so that she can give it back to charity. As they wait their turn, they find that their key does fit the lock. However, when they turn it, they suddenly vanish from the scene. They find them rocketing through the air, and as they try to make sense of their situation the key suddenly grows to a gigantic size, enveloping them both and transforming into a space ship. 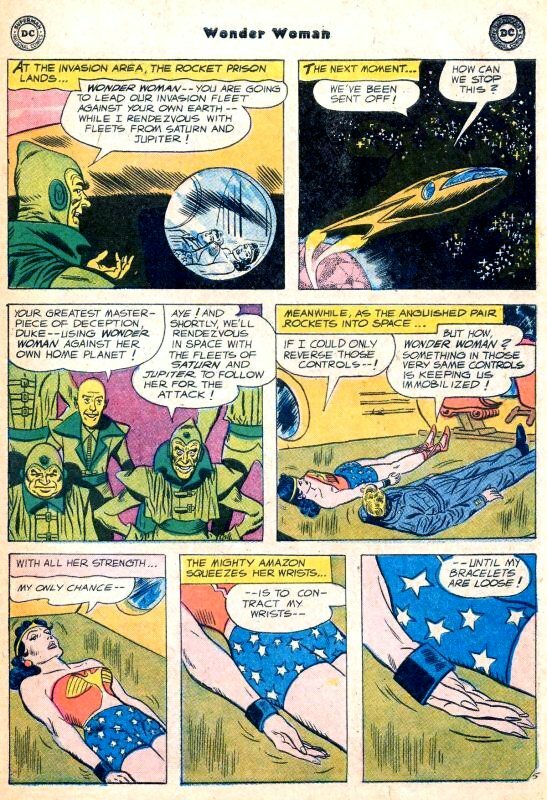 As they speed off into space, the g-forces press them to the floor of the craft and as they rocket past the planet Mars, Wonder Woman realises that it could only be her old foe the Duke of Deception that could possible be behind this plot against her. Witnessing this success, the Duke of Deception then gives the orders for his invasion fleets on Pluto, Saturn and Mars to prepare for an attack on Earth. 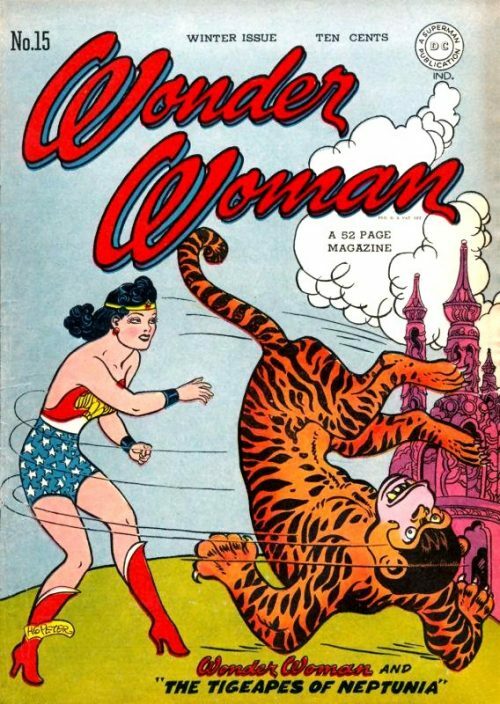 Meanwhile, Wonder Woman pries off one of her bracelets and uses it to strike the controls of her ship, causing it to slow down enough so that they can get up right. 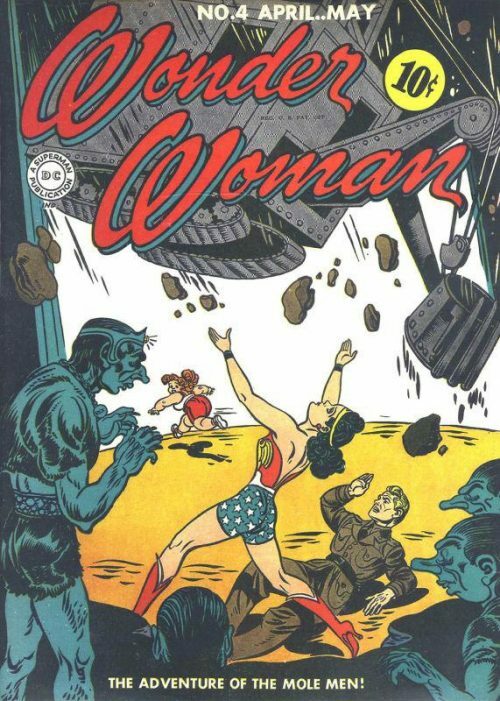 Out past Pluto, Wonder Woman pilots her ship back to stop the first third of the fleet launching from there. Next she stops the fleet leaving Saturn and then puts a chase for the invasion fleet leaving from Mars, which consists of one single ship carrying the Duke of Deception. 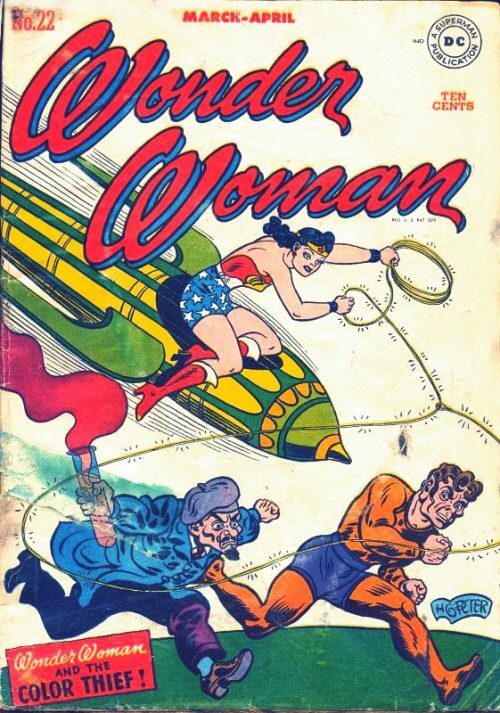 Chasing through through the stars, the Duke of Deception falls for Wonder Woman’s trick: She lure him right into the flight path of the new rocket that just left Earth. 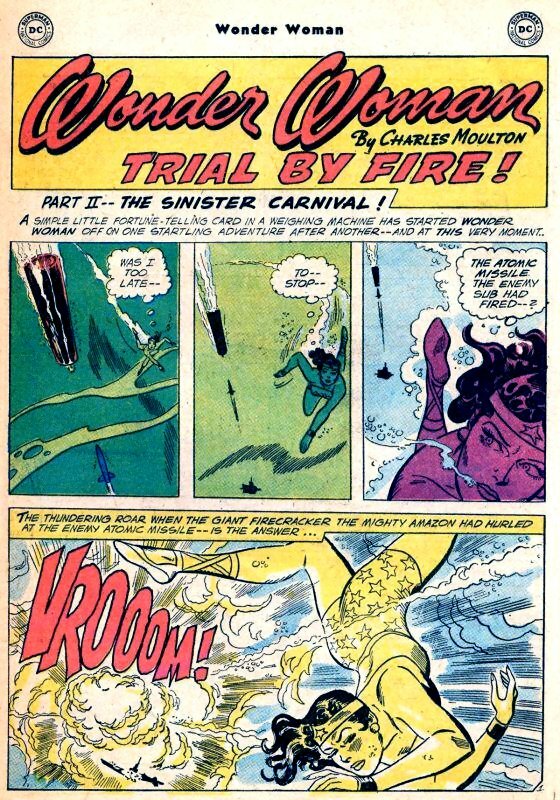 Upon impact with the satellite, the Martian ship is destroyed and Wonder Woman and Steve Trevor escape, having foiled the Martian invasion of Earth.